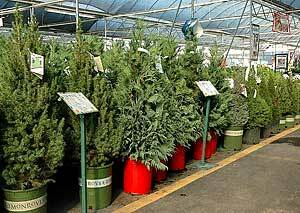 What will you choose, a real or artificial tree? It didn’t take a math wizard to understand how quickly one can go broke paying for $200 trees each year when today’s fake trees look so realistic. Besides, now they come pre-lit, assemble in three easy pieces and store in a sturdy cardboard box. Within two years, they pay for themselves and on top of that, just think of all the trees I’d save over the years. We did our shopping, found an artificial tree we liked and made the investment. I felt pretty good about knowing I’d never have to buy another ‘throw-away’ tree again and I’d be doing something good for the environment too. Then came the move to North Carolina and with it, a house with no ceiling taller than nine feet. That first December, we’re back to square one. Now living near the land of Christmas tree farms galore, what do we do this time? Actually the decision was easy. Over the previous year, I had researched a lot about various aspects of living a more eco-friendly life as I collected research for my upcoming book. Everything I thought I was doing right for the environment in defense of buying an artificial tree went out the window. Here are a few of the reasons why as noted in a recent conversation I had with Rick Dungey, Public Relations Manager for the National Christmas Tree Association. it is still fresh and the scent of the mulch laid between my raised beds is an added bonus. We always use to get a real tree until the year the local fireman came to our elementary school and pleaded with use to get an artificial tree. The fireman was literally in tears discussing how dangerous a fire hazard a real Christmas trees is. So I guess if you are going with a real Christmas tree it should be a live one that can be replanted once the season is over. Well that is a valid point. I guess we don’t think how really dry those cut trees can get until it’s time to take it down and all the needles (what’s left of them) carpet the floor as we drag the tree outside. Honestly, it’s a scary thought and one I’m sure is a real and more frequent risk than we realize. Obviously that fireman has witnessed this firsthand. You’re also right in that a live, potted tree is by far the better choice for fire resistance, plus the added benefit of placing that tree into your landscape after the season. That’s a win-win. Of course the downside is, those potted trees are never quite like the traditional big tree look we’re after. But as with everything in life, there are tradeoffs. Ah, it must be a real tree live or cut tree! You know in Southern California it’s the scent of the Season that makes our Christmas. I know what you mean Annie. Having grown up in Miami, the scent of that Christmas pine in the house made it seem like we were miles away. That’s a real bummer Jay. Sorry to hear that! I like a real tree that I can replant. But the best tree my family ever had was a tree branch mom found and dressed it up with some old junk jewelry. It was quite unique. Well said Michelle. Sometimes the simplest things are the most memorable. Thanks for sharing. I like the real tree. I enjoy the fragrance, then I mulch it and it’s gone. Nothing to store.